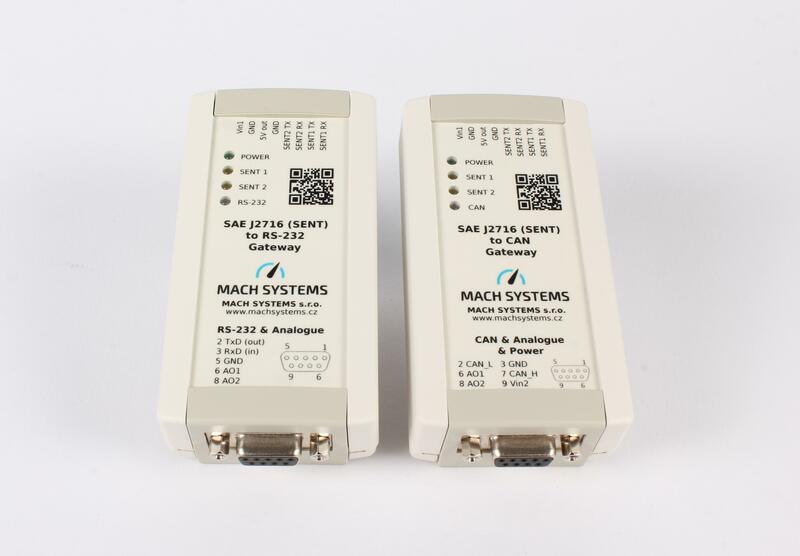 SAE J2716 to RS-232/CAN Bus Interface - MACH SYSTEMS s.r.o. 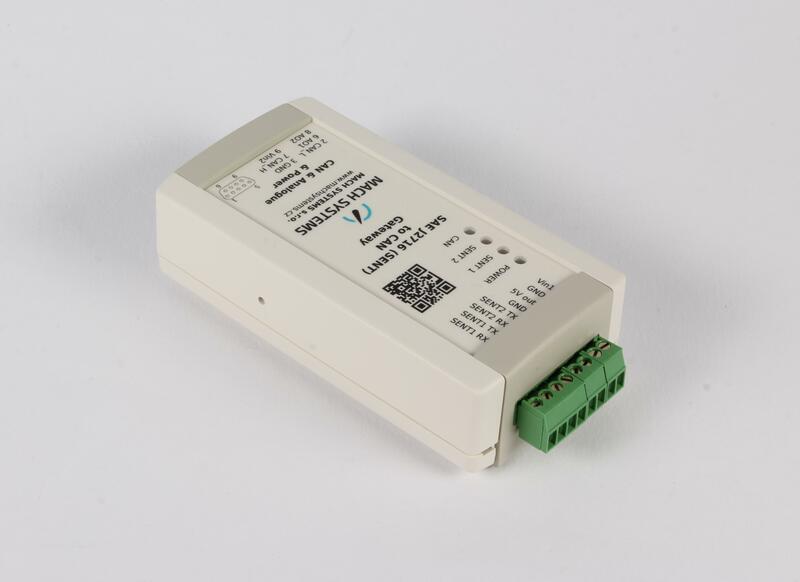 SAE J2716 – SENT bus (Single Edge Nibble Transmission) is a single-wire unidirectional bus used for communication between a sensor and an ECU. 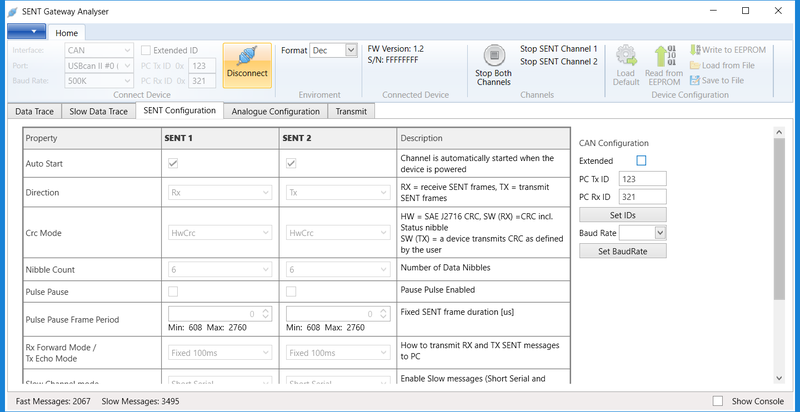 The SENT network has been introduced in the automotive industry and is mostly used to transfer sensor values like temperature, pressure, proximity/angle (Hall Effect) into a MCU. The SAE J2716 protocol uses TTL 0-5V digital modulation with re-synchronization fields, and the SENT bus is faster and cheaper than the LIN bus. We offer SENT interfaces – SENT-RS232 and SENT-CAN for SAE J2716 monitoring and simulation. 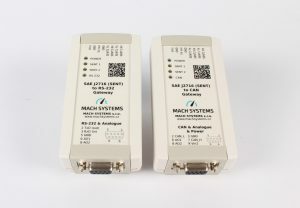 Both gateways (converters) feature two bi-directional SENT channels and RS-232 or a CAN bus interface enabling the user to access the SENT bus from other networks and systems. The new 2019 version also features two analogue output channels that can directly convert SENT data frame signals into an analogue voltage (12-bit, 0-4.095 V). Conversion parameters are configurable by the user. 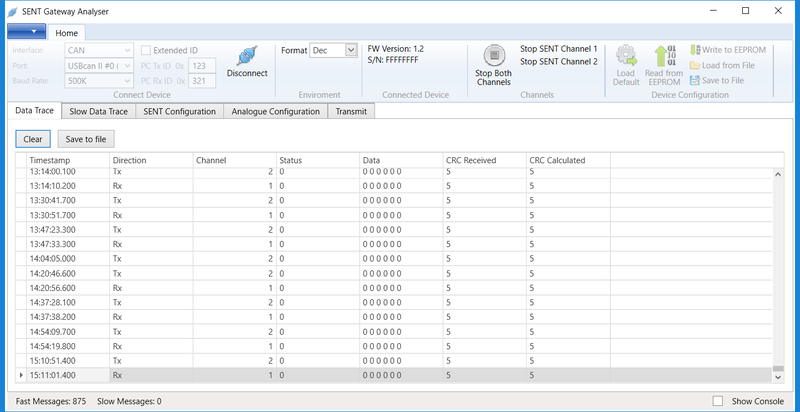 Each SENT channel is bi-directional and its parameters (Direction, Tick Time, Data Nibble Count, Pause Pulse) are configurable and can be stored into the device’s non-volatile memory. Both Fast and Slow Messages are supported (Fast, Short Serial, Enhanced Serial) according to SAE J2716:2016 protocol specification. An intelligent message filtration is introduced so that RS-232 or a CAN bus does not get overloaded. 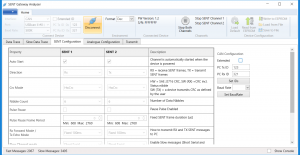 A PC application for SENT channel configuration, reception and transmission of SENT frames is provided free-of-charge. The user can change channel parameters, view and log incoming Fast and Slow Messages and transmit Fast and Slow frames, too. The device can easily be integrated into an existing software/system with the help of a communication protocol, and the gateway firmware can be upgraded from a PC tool. A typical use-case of the SENT-RS232 interface is to access the SENT bus from a computer or an assembly line/tester and satisfies the needs of development, simulation and testing. 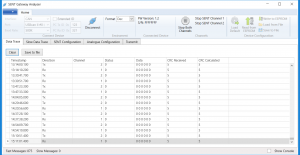 The SENT-CAN gateway can be used similarly and additionally offers changeable CAN identifiers which allows multiple SENT-CAN devices on the same CAN bus, which enables a great flexibility in parallel testing and simulation of the SENT protocol. The two analogue output channels can be mapped onto a SENT data signal, providing a direct conversion from SAE J2716 into an analogue voltage. This is useful for systems that cannot communicate over the SENT bus.